Edward Roscoe Murrow, KBE (born Egbert Roscoe Murrow; April 25, 1908 – April 27, 1965) was an American broadcast journalist and war correspondent. He first gained prominence during World War II with a series of live radio broadcasts from Europe for the news division of CBS. During the war he recruited and worked closely with a team of war correspondents who came to be known as the Murrow Boys. A pioneer of radio and television news broadcasting, Murrow produced a series of reports on his television program See It Now which helped lead to the censure of Senator Joseph McCarthy. Fellow journalists Eric Sevareid, Ed Bliss, Bill Downs, Dan Rather, and Alexander Kendrick consider Murrow one of journalism's greatest figures, noting his honesty and integrity in delivering the news. Murrow was born Egbert Roscoe Murrow at Polecat Creek, near Greensboro, in Guilford County, North Carolina, the son of Roscoe Conklin Murrow and Ethel F. (née Lamb) Murrow. His parents were Quakers. He was the youngest of three brothers and was a "mixture of Scottish, Irish, English and German" descent. The firstborn, Roscoe Jr., lived only a few hours. Lacey Van Buren was four years old and Dewey Joshua was two years old when Murrow was born. His home was a log cabin without electricity or plumbing, on a farm bringing in only a few hundred dollars a year from corn and hay. When Murrow was six years old, his family moved across the country to Skagit County in western Washington, to homestead near Blanchard, 30 miles (50 km) south of the Canada–US border. He attended high school in nearby Edison, and was president of the student body in his senior year and excelled on the debate team. He was also a member of the basketball team which won the Skagit County championship. After graduation from high school in 1926, Murrow enrolled at Washington State College (now Washington State University) across the state in Pullman, and eventually majored in speech. A member of the Kappa Sigma fraternity, he was also active in college politics. By his teen years, Murrow went by the nickname "Ed" and during his second year of college, he changed his name from Egbert to Edward. In 1929, while attending the annual convention of the National Student Federation of America, Murrow gave a speech urging college students to become more interested in national and world affairs; this led to his election as president of the federation. After earning his bachelor's degree in 1930, he moved back east to New York. Murrow was assistant director of the Institute of International Education from 1932 to 1935 and served as assistant secretary of the Emergency Committee in Aid of Displaced Foreign Scholars, which helped prominent German scholars who had been dismissed from academic positions. He married Janet Huntington Brewster on March 12, 1935. Their son, Charles Casey Murrow, was born in the west of London on November 6, 1945. Murrow joined CBS as director of talks and education in 1935 and remained with the network for his entire career. CBS did not have news staff when Murrow joined, save for announcer Bob Trout. Murrow's job was to line up newsmakers who would appear on the network to talk about the issues of the day. But the onetime Washington State speech major was intrigued by Trout's on-air delivery, and Trout gave Murrow tips on how to communicate effectively on radio. Murrow went to London in 1937 to serve as the director of CBS's European operations. The position did not involve on-air reporting; his job was persuading European figures to broadcast over the CBS network, which was in direct competition with NBC's two radio networks. During this time, he made frequent trips around Europe. In 1937, Murrow hired journalist William L. Shirer, and assigned him to a similar post on the continent. This marked the beginning of the "Murrow Boys" team of war reporters. Murrow gained his first glimpse of fame during the March 1938 Anschluss, in which Adolf Hitler engineered the annexation of Austria by Nazi Germany. While Murrow was in Poland arranging a broadcast of children's choruses, he got word from Shirer of the annexation—and the fact that Shirer could not get the story out through Austrian state radio facilities. Murrow immediately sent Shirer to London, where he delivered an uncensored, eyewitness account of the Anschluss. Murrow then chartered the only transportation available, a 23-passenger plane, to fly from Warsaw to Vienna so he could take over for Shirer. At the request of CBS management in New York, Murrow and Shirer put together a European News Roundup of reaction to the Anschluss, which brought correspondents from various European cities together for a single broadcast. On March 13, 1938, the special was broadcast, hosted by Bob Trout in New York, including Shirer in London (with Labour MP Ellen Wilkinson), reporter Edgar Ansel Mowrer of the Chicago Daily News in Paris, reporter Pierre J. Huss of the International News Service in Berlin, and Senator Lewis B. Schwellenbach in Washington, D.C. Reporter Frank Gervasi, in Rome, was unable to find a transmitter to broadcast reaction from the Italian capital, but phoned his script to Shirer in London, who read it on the air. :116–120 Murrow reported live from Vienna, in the first on-the-scene news report of his career: "This is Edward Murrow speaking from Vienna.... It's now nearly 2:30 in the morning, and Herr Hitler has not yet arrived." The broadcast was considered revolutionary at the time. Featuring multipoint, live reports transmitted by shortwave in the days before modern technology (and without each of the parties necessarily being able to hear one another), it came off almost flawlessly. The special became the basis for World News Roundup—broadcasting's oldest news series, which still runs each weekday morning and evening on the CBS Radio Network. In September 1938, Murrow and Shirer were regular participants in CBS's coverage of the crisis over the Sudetenland in Czechoslovakia, which Hitler coveted for Germany and eventually won in the Munich Agreement. Their incisive reporting heightened the American appetite for radio news, with listeners regularly waiting for Murrow's shortwave broadcasts, introduced by analyst H. V. Kaltenborn in New York saying, "Calling Ed Murrow ... come in Ed Murrow." During the following year, leading up to the outbreak of World War II, Murrow continued to be based in London. William Shirer's reporting from Berlin brought him national acclaim, and a commentator's position with CBS News upon his return to the United States in December 1940. (Shirer would describe his Berlin experiences in his best-selling 1941 book Berlin Diary.) 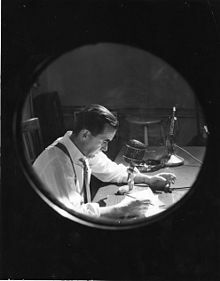 When the war broke out in September 1939, Murrow stayed in London, and later provided live radio broadcasts during the height of the Blitz in London After Dark. These live, shortwave broadcasts relayed on CBS electrified radio audiences as news programming never had: previous war coverage had mostly been provided by newspaper reports, along with newsreels seen in movie theaters; earlier radio news programs had simply featured an announcer in a studio reading wire service reports. Murrow's reports, especially during the Blitz, began with what became his signature opening, "This is London," delivered with his vocal emphasis on the word this, followed by the hint of a pause before the rest of the phrase. His former speech teacher, Ida Lou Anderson, suggested the opening as a more concise alternative to the one he had inherited from his predecessor at CBS Europe, Cesar Saerchinger: "Hello America. This is London calling." Murrow's phrase became synonymous with the newscaster and his network. Murrow achieved great celebrity status as a result of his war reports. They led to his second famous catchphrase. At the end of 1940, with every night's German bombing raid, Londoners who might not necessarily see each other the next morning often closed their conversations with "good night, and good luck." The future British monarch, Princess Elizabeth, said as much to the Western world in a live radio address at the end of the year, when she said "good night, and good luck to you all". So, at the end of one 1940 broadcast, Murrow ended his segment with "Good night, and good luck." Speech teacher Anderson insisted he stick with it, and another Murrow catchphrase was born. The Japanese attack on Pearl Harbor occurred less than a week after this speech, and the U.S. entered the war as a combatant on the Allied side. As hostilities expanded, Murrow expanded CBS News in London into what Harrison Salisbury described as "the finest news staff anybody had ever put together in Europe". :230 The result was a group of reporters acclaimed for their intellect and descriptive power, including Eric Sevareid, Charles Collingwood, Howard K. Smith, Mary Marvin Breckinridge, Cecil Brown, Richard C. Hottelet, Bill Downs, Winston Burdett, Charles Shaw, Ned Calmer, and Larry LeSueur. Many of them, Shirer included, were later dubbed "Murrow's Boys"—despite Breckinridge being a woman. In 1944, Murrow sought Walter Cronkite to take over for Bill Downs at the CBS Moscow bureau. Cronkite initially accepted, but after receiving a better offer from his current employer, United Press, he turned down the offer. Murrow so closely cooperated with the British that in 1943 Winston Churchill offered to make him joint director-general of the BBC in charge of programming. Although he declined the job, during the war Murrow did fall in love with Churchill's daughter-in-law, Pamela,:221–223,244 whose other American lovers included Averell Harriman, whom she married many years later. Pamela wanted Murrow to marry her, and he considered it; however, after his wife gave birth to their only child, Casey, he ended the affair. After the war, Murrow recruited journalists such as Alexander Kendrick, David Schoenbrun, Daniel Schorr and Robert Pierpoint into the circle of the Boys as a virtual "second generation", though the track record of the original wartime crew set it apart. In December 1945 Murrow reluctantly accepted William S. Paley's offer to become a vice president of the network and head of CBS News, and made his last news report from London in March 1946.:259,261 His presence and personality shaped the newsroom. After the war, he maintained close friendships with his previous hires, including members of the Murrow Boys. Younger colleagues at CBS became resentful toward this, viewing it as preferential treatment, and formed the "Murrow Isn't God Club." The club disbanded when Murrow asked if he could join. Shirer contended that the root of his troubles was the network and sponsor not standing by him because of his comments critical of the Truman Doctrine, as well as other comments that were considered outside of the mainstream. Shirer and his supporters felt he was being muzzled because of his views. Meanwhile, Murrow, and even some of Murrow's Boys, felt that Shirer was coasting on his high reputation and not working hard enough to bolster his analyses with his own research. Murrow and Shirer never regained their close friendship. Murrow returned to the air in September 1947, taking over the nightly 7:45 p.m. ET newscast sponsored by Campbell's Soup and anchored by his old friend and announcing coach Bob Trout. For the next several years Murrow focused on radio, and in addition to news reports he produced special presentations for CBS News Radio. In 1950, he narrated a half-hour radio documentary called "The Case of the Flying Saucer." It offered a balanced look at UFOs, a subject of widespread interest at the time. Murrow interviewed both Kenneth Arnold and astronomer Donald Menzel. From 1951 to 1955, Murrow was the host of This I Believe, which offered ordinary people the opportunity to speak for five minutes on radio. He continued to present daily radio news reports on the CBS Radio Network until 1959. He also recorded a series of narrated "historical albums" for Columbia Records called I Can Hear It Now, which inaugurated his partnership with producer Fred W. Friendly. In 1950 the records evolved into a weekly CBS Radio show, Hear It Now, hosted by Murrow and co-produced by Murrow and Friendly. As the 1950s began, Murrow began his television career by appearing in editorial "tailpieces" on the CBS Evening News and in the coverage of special events. This came despite his own misgivings about the new medium and its emphasis on pictures rather than ideas. In 1952, Murrow narrated the political documentary Alliance for Peace, an information vehicle for the newly formed SHAPE detailing the effects of the Marshall Plan upon a war-torn Europe. It was written by William Templeton and produced by Samuel Goldwyn, Jr. In 1953, Murrow launched a second weekly TV show, a series of celebrity interviews entitled Person to Person. See It Now focused on a number of controversial issues in the 1950s, but it is best remembered as the show that criticized McCarthyism and the Red Scare, contributing, if not leading, to the political downfall of Senator Joseph McCarthy. McCarthy had previously commended Murrow for his fairness in reporting. When a quiz show phenomenon began and took TV by storm in the mid-1950s, Murrow realized the days of See It Now as a weekly show were numbered. (Biographer Joseph Persico notes that Murrow, watching an early episode of The $64,000 Question air just before his own See It Now, is said to have turned to Friendly and asked how long they expected to keep their time slot). In 1956, Murrow took time to appear as the on-screen narrator of a special prologue for Michael Todd's epic production, Around the World in 80 Days. Although the prologue was generally omitted on telecasts of the film, it was included in home video releases. Beginning in 1958, Murrow hosted a talk show entitled Small World that brought together political figures for one-to-one debates. In January 1959, he appeared on WGBH's The Press and the People with Louis Lyons, discussing the responsibilities of television journalism. Murrow appeared as himself in a cameo in the British film production of Sink the Bismarck! in 1960, recreating some of the wartime broadcasts he did from London for CBS. After contributing to the first episode of the documentary series CBS Reports, Murrow, increasingly under physical stress due to his conflicts and frustration with CBS, took a sabbatical from summer 1959 to mid-1960, though he continued to work on CBS Reports and Small World during this period. Friendly, executive producer of CBS Reports, wanted the network to allow Murrow to again be his co-producer after the sabbatical, but he was eventually turned down. Murrow resigned from CBS to accept a position as head of the United States Information Agency, parent of the Voice of America, in January 1961. President John F. Kennedy offered Murrow the position, which he viewed as "a timely gift." CBS president Frank Stanton had reportedly been offered the job but declined, suggesting that Murrow be offered the job. His appointment as head of the United States Information Agency was seen as a vote of confidence in the agency, which provided the official views of the government to the public in other nations. The USIA had been under fire during the McCarthy era, and Murrow reappointed at least one of McCarthy's targets, Reed Harris. Murrow insisted on a high level of presidential access, telling Kennedy, "If you want me in on the landings, I'd better be there for the takeoffs." However, the early effects of cancer kept him from taking an active role in the Bay of Pigs Invasion planning. He did advise the president during the Cuban Missile Crisis but was ill at the time the president was assassinated. Murrow was drawn into Vietnam because the USIA was assigned to convince reporters in Saigon that the government of Ngo Dinh Diem embodied the hopes and dreams of the Vietnamese people. Murrow knew the Diem government did no such thing. Asked to stay on by President Lyndon B. Johnson, Murrow did so but resigned in early 1964, citing illness. Before his departure, his last recommendation was of Barry Zorthian to be chief spokesman for the U.S. government in Saigon, Vietnam. Murrow's celebrity gave the agency a higher profile, which may have helped it earn more funds from Congress. 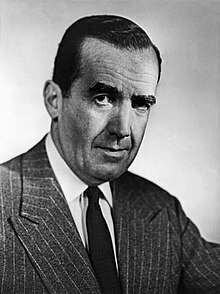 His transfer to a governmental position – Murrow was a member of the National Security Council, a position for life – led to an embarrassing incident shortly after taking the job; he asked the BBC not to show his documentary "Harvest of Shame," in order to not damage the European view of the USA; however, the BBC refused as it had bought the program in good faith. British newspapers delighted in the irony of the situation, with one Daily Sketch writer saying: "if Murrow builds up America as skillfully as he tore it to pieces last night, the propaganda war is as good as won." A chain smoker throughout his life, Murrow was almost never seen without his trademark Camel cigarette. It was reported that he smoked between sixty and sixty-five cigarettes a day, equivalent to roughly three packs. See It Now was the first television program to have a report about the connection between smoking and cancer. During the show, Murrow said that "I doubt I could spend a half hour without a cigarette with any comfort or ease." He developed lung cancer and lived for two years after an operation to remove his left lung. Murrow died at his home in Pawling, New York, on April 27, 1965, two days after his 57th birthday. His colleague and friend Eric Sevareid said of him, "He was a shooting star; and we will live in his afterglow a very long time." CBS carried a memorial program, which included a rare on-camera appearance by William S. Paley, founder of CBS. Murrow has been repeatedly honored with the Peabody Award, jointly and individually. In 1947 Murrow received the Alfred I. duPont Award. He was made an honorary Knight Commander of the Order of the British Empire by Queen Elizabeth II on March 5, 1965 and received similar honors from the governments of Belgium, France, and Sweden. He received "Special" George Polk Awards in 1951 and 1952. In 1967, he was awarded the Grammy Award for Best Spoken Word Album for his Edward R. Murrow – A Reporter Remembers, Vol. I The War Years. The Edward R. Murrow Award, given annually by the Radio Television Digital News Association is named in his honor; it is presented for "outstanding achievement in electronic journalism"
The Edward R. Murrow College of Communication at Washington State University is named in his honor. The Edward R. Murrow Park in Washington, D.C. is named in his memory. Edward R. Murrow High School in Brooklyn, New York is named after him. In 1984, Murrow was posthumously inducted into the Television Hall of Fame. In 1996, Murrow was ranked # 22 on TV Guides "50 Greatest TV Stars of All Time" list. After Murrow's death, the Edward R. Murrow Center of Public Diplomacy was established at Tufts University's Fletcher School of Law and Diplomacy. Murrow's library and selected artifacts are housed in the Murrow Memorial Reading Room that also serves as a special seminar classroom and meeting room for Fletcher activities. Murrow's papers are available for research at the Digital Collections and Archives at Tufts, which has a website for the collection and makes many of the digitized papers available through the Tufts Digital Library. The center awards Murrow fellowships to mid-career professionals who engage in research at Fletcher, ranging from the impact of the "new world information order" debate in the international media during the 1970s and 1980s to, currently, telecommunications policies and regulation. Many distinguished journalists, diplomats, and policymakers have spent time at the center, among them the late David Halberstam, who worked on his Pulitzer Prize–winning book, The Best and the Brightest, as a writer-in-residence in the early 1970s. Veteran journalist Crocker Snow, Jr. was named director of the Murrow Center in 2005. In 1971 the RTNDA (Now Radio Television Digital News Association) established the Edward R. Murrow Awards, honoring outstanding achievement in the field of electronic journalism. There are four other awards also known as the "Edward R. Murrow Award," including the one at Washington State University. In 1973, Murrow's alma mater, Washington State University, dedicated its expanded communication facilities the Edward R. Murrow Communications Center and established the annual Edward R. Murrow Symposium. In 1990, the WSU Department of Communications became the Edward R. Murrow School of Communication, followed on July 1, 2008, with the school becoming the Edward R. Murrow College of Communication. Veteran international journalist Lawrence Pintak is the college's founding dean. Several movies were filmed, either completely or partly about Murrow. In 1986, HBO broadcast the made-for-cable biographical movie, Murrow, with Daniel J. Travanti in the title role, and Robert Vaughn in a supporting role. In the 1999 film The Insider, Lowell Bergman, a television producer for the CBS news magazine 60 Minutes, played by Al Pacino, is confronted by Mike Wallace, played by Christopher Plummer, after an exposé of the tobacco industry is edited down to suit CBS management and then, itself, gets exposed in the press for the self-censorship. Wallace passes Bergman an editorial printed in The New York Times, which accuses CBS of betraying the legacy of Edward R. Murrow. Good Night, and Good Luck is a 2005 Oscar-nominated film directed, co-starring and co-written by George Clooney about the conflict between Murrow and Joseph McCarthy on See It Now. Murrow is portrayed by actor David Strathairn, who received an Oscar nomination. In the film, Murrow's conflict with CBS boss William Paley occurs immediately after his skirmish with McCarthy. ^ "Edward R. Murrow". NCPedia. State Library of North Carolina. Retrieved 10 August 2016. ^ Hattikudur, Mangesh (January 28, 2008). "What Richard Nixon and James Dean had in common". CNN.com. Retrieved 2008-01-31. ^ "Edward R. Murrow, Broadcaster And Ex-Chief of U.S.I.A., Dies" (obituary). The New York Times. April 28, 1965. Retrieved August 10, 2016. ^ Russell, Norton (October 1940). "They Also Serve: Edward R. Murrow" (PDF). Radio and Television Mirror (Vol. 14, No. 6). pp. 19, 68–69. Retrieved 10 August 2016. ^ a b c Wertenbaker, Charles (26 December 1953). "The World On His Back". The New Yorker. Retrieved 28 July 2017. ^ Russell, Norton (October 1940). "They Also Serve: Edward R. Murrow" (PDF). Radio and Television Mirror (Vol. 14, No. 6). p. 68. Retrieved 10 August 2016. ^ Kit Oldham (26 October 2005). "Edward R. Murrow graduates from Washington State College on June 2, 1930". HistoryLink.org. Retrieved 2012-08-11. ^ "This — is London1". The Attic. Retrieved 19 October 2018. ^ Hershey Jr., Robert D. (July 23, 2010). "Daniel Schorr, Journalist, Dies at 93". The New York Times. Retrieved July 23, 2010. ^ "Buchenwald: Report from Edward R. Murrow". Jewish Virtual Library. Retrieved 28 July 2017. ^ Cuthbertson, Keith (1 May 2015). Books on Google Play A Complex Fate: William L. Shirer and the American Century. McGill-Queen's University Press. ISBN 0773597247. ^ "The Crucial Decade: Voices of the Postwar Era, 1945-1954". National Archives. National Archives. Retrieved 10 August 2016. ^ Edward R. Murrow (April 7, 1950). "The Case of the Flying Saucer". Special News Report. CBS Radio News. ^ "A Report on Senator Joseph R. McCarthy". See It Now. CBS. March 9, 1954. Retrieved November 23, 2008. ^ Adams, Val (11 March 1954). "PRAISE POURS IN ON MURROW SHOW". New York Times. p. 19. ^ "Prosecution of E. R. Murrow on CBS' "See It Now"". See It Now. CBS. April 6, 1954. Retrieved August 10, 2016. ^ "Edward R. Murrow", American Masters, PBS. Retrieved March 28, 2008. ^ "Response to Senator Joe McCarthy". See It Now. CBS. April 13, 1954. Retrieved August 10, 2016. ^ "The Press and the People: The Responsibilities of Television, Part II". Open Vault from WGBH. WGBH Media Library and Archives. January 24, 1959. Retrieved 10 August 2016. ^ Smith, Sally Bedell (November 1990). In All His Glory: The Life of William S. Paley : The Legendary Tycoon and His Brilliant Circle. Simon & Schuster. ISBN 978-0-671-61735-6. ^ "Edward R. Murrow Speech". Radio-Television News Directors Association. October 15, 1958. Retrieved August 10, 2016. ^ "National Press Club Luncheon Speakers, Edward R. Murrow, May 24, 1961". Library of Congress. Retrieved October 20, 2016. ^ "Reed Harris Dies. Did Battle With Sen. Joseph McCarthy". The New York Times. October 21, 1982. Retrieved March 22, 2008. Reed Harris, 72, a writer, publisher, and former State Department official who was driven from government for a time after a highly publicized confrontation with the late Sen. Joseph R. McCarthy (R-Wis.), died Oct. 15 at Holy Cross Hospital. He had a heart ailment and Alzheimer's disease. ^ Jurek Martin (15 January 2011). "US spokesman who fronted Saigon's theatre of war". Financial Times. ft.com. Retrieved 2011-08-10. ^ "Murrow Tries to Halt Controversial TV Film". The Victoria Advocate. Associated Press. 24 March 1961. p. 9. Retrieved 10 August 2016. ^ "George Foster Peabody Award Winners" (PDF). University of Georgia. Archived from the original (PDF) on 2011-07-26. Retrieved 2012-08-11. ^ "Edward R. Murrow". Greensboro Daily Photo. 2 April 2009. Retrieved 2012-08-11. ^ Ryan Thomas. "Murrow College History 1973–1980". Washington State University. Archived from the original on 2012-03-08. Retrieved 2012-08-11. ^ Ryan Thomas. "Murrow College History 1980–1990". Washington State University. Archived from the original on 2012-03-08. Retrieved 2012-08-11. ^ "Austen Named to Lead Murrow College of Communication" (Press release). Washington State University. 30 June 2008. Archived from the original on 1 October 2011. Retrieved 2012-08-11. Wikimedia Commons has media related to Edward R. Murrow. "Edward R. Murrow". Journalist, Radio Broadcaster. Find a Grave. April 27, 1965. Retrieved September 3, 2010.